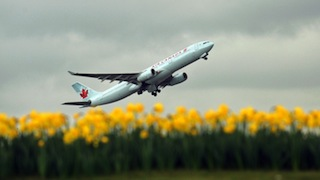 A Frankfurt-bound Air Canada jet drove off the runway at Toronto International Thursday evening and got stuck in the grass.The Toronto Star reports that the pilot is blaming the incident on a problem with the landing gear (wheels pointed in the wrong direction?). After surviving the most innocuous crash in aviation history, passengers were forced to wait for roughly an hour before being shuttled back to the airport and put up for the night by the airline. A passenger told The Star that the "people were very patient and had good humor," which is exactly the last thing a passenger would have said if the accident occurred at, let's say, Newark's Liberty International. Crews spent Thursday night trying to move the plane off of the grass after it sank into the soil.